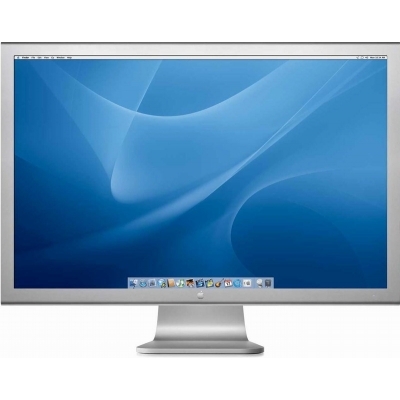 The 30-inch Apple Cinema HD Display delivers an amazing 2560 x 1600 pixel resolution. Designed specifically for the creative professional, this display provides more space for easier access to all the tools and palettes needed to edit, format, and composite your work. * 30-inch (viewable) active-matrix liquid crystal display provides breathtaking image quality and vivid color. * Support for 2560-by-1600 pixel resolution for display of high definition still and video imagery. * Wide-format design for simultaneous display of two full pages of text and graphics. * Industry-standard DVI connector for attachment to Mac- and Windows-based desktops and notebooks. * Incredibly wide (178 degree) horizontal and vertical viewing angle for maximum visibility and color performance. * Single cable with elegant breakout for connection to DVI, USB and FireWire ports. * Built-in two-port USB 2.0 hub for easy connection of desktop peripheral devices. * Two FireWire 400 ports to support iSight and other desktop peripherals. * Unique hinge design for effortless adjustment. * Support for VESA mounting solutions (Apple Cinema Display VESA Mount Adapter sold separately). This used Apple 30 Inch display is in excellent condition. The screen is clear and bright and was used in a non smoking environment. It comes complete and ready for use with power adapter/brick and power cord.